Many Excel users think that the IF function is the program's most powerful conditional tool. But it turns out that there are a whole class of even more powerful functions that allow you to perform conditional calculations on large ranges of data. To begin, we'll start by learning about the most simple of these: the SUMIF function. 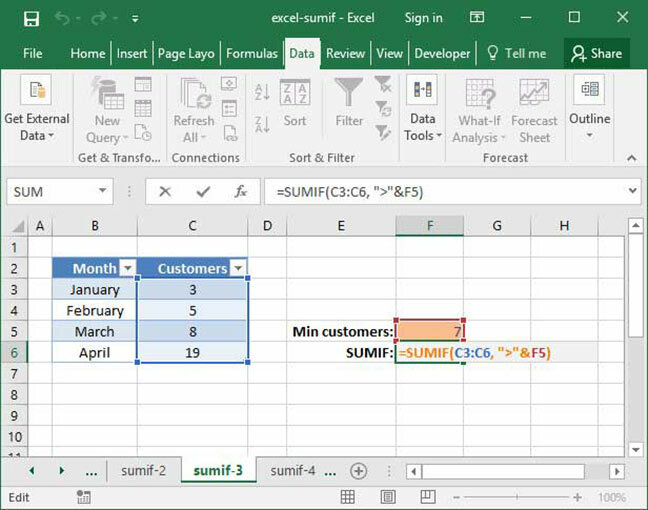 Excel's SUMIF allows you to perform a SUM of a particular range of data, but only include numbers for which certain conditions are met. For example, say we have a database of sales by product category. 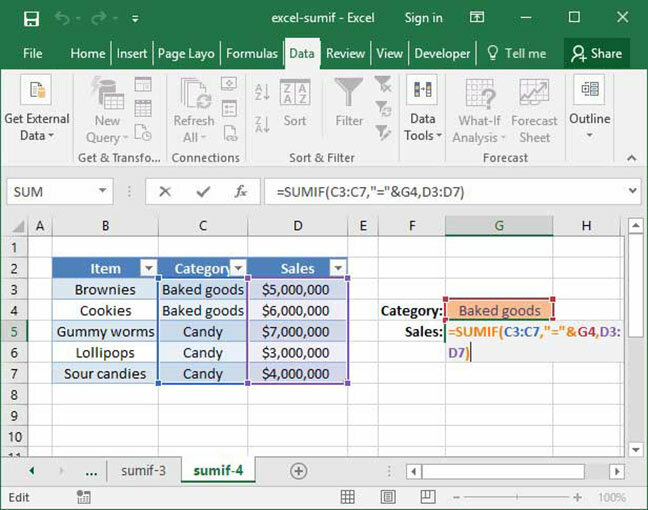 We can take the SUM of all products in the category Candy by using a SUMIF function. Let's take a look at how it looks. Let's say we want to find out how much money SnackWorld made from selling all items in the Baked Goods category. With a large spreadsheet, it would be a pain to sum these all up manually. Fortunately, we have the SUMIF function to assist us. Notice that the sum_range argument at the end of the function is optional. We'll use that argument with most of our applications of SUMIF, but first, let's take a look at what happens when we leave it off. What's going on here? First, Excel looks at the cells C3:C6, which it knows we want to take the SUM of. 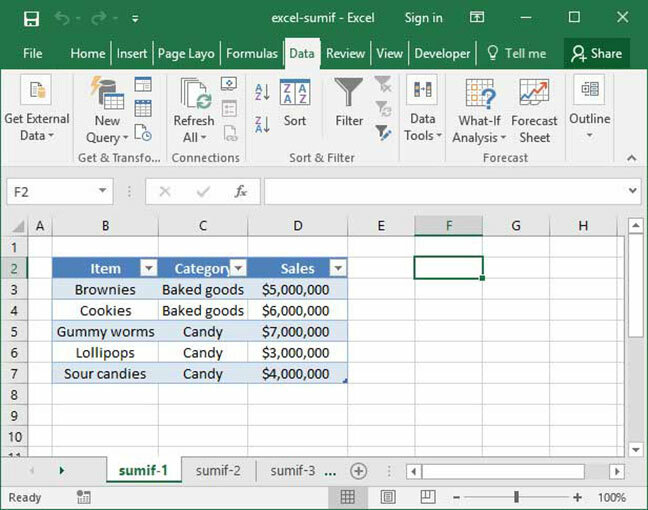 However, there's a condition: Excel looks at the criteria column to see whether there are any cells that we should exclude from the SUM. As it turns out, the criteria we've set here is ">"&7. This means that Excel should only include cells whose value is greater than or equal to 7 in our SUMIF. Therefore, the only cells it includes are C5 and C6 — which contain the values 8 and 19. The final output is 27. What's with the quotes and ampersand around the ">"&7? It turns out that the condition argument takes a string, not a logical expression. It's a bit confusing for beginners, but that's just the way it's built! 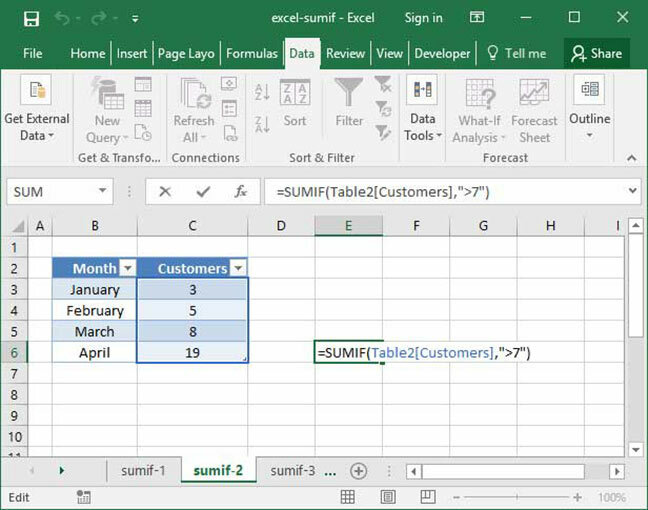 We enclose the > sign in quotes (" ") to turn it into a string that Excel recognizes. We then use the ampersand (&) sign to join this string to a regular number, 7, which we also want to include in our conditional statement. See how we use the & sign to join the ">" string with a cell reference to F5? If we included the argument F5 within the quotes, the formula wouldn't work, because Excel would treat it as a string rather than a cell reference. What we've done so far is nice, but not particularly useful. Why would we only want to take the sum of Customers if the number of customers in any given month is greater than seven? That's when the third argument of SUMIF comes in: sum_range. This argument will allow us to take the sum of a range that's different from our condition. In other words, SUMIF will take the SUM of everything in sum_range, but only if the given condition is met for everything within the range provided. As you can see, the SUMIF function takes the sum of everything our our sum_range (D3:D7), but only if the corresponding cells in our range (C3:C7) meet our stated condition ("="&G4). Since cell G4 contains the phrase "Baked goods", only cells D3 and D4 are included in the sum, for a total of $11,000,000. That's it! Now you can use the SUMIF function to selectively take the sum of items in a range based on a particular logical expression performed on other cells. Now that you're comfortable with SUMIF, you may be wondering whether it's possible to sum a range based on multiple criteria rather than a single one. You're in luck — our SUMIFS tutorial will show you how!